Jennifer Lopez is very happy while she hangs onto Marc Anthony at the after-party held at New York City’s STK restaurant on Saturday night, February 27. Earlier in the evening, Jennifer hosted and performed two songs from her upcoming album, called “Starting Over” and “Pieces.” What do you think of her new tunes?? This entry was posted in Celebs, Jennifer Lopez, Marc Anthony, Music on February 28, 2010 by admin. Jennifer Aniston and Gerard Butler left the peaceful hideaway in Mexico and came back to Los Angeles. The actress, who turns 41 on Thursday, came back home on a private plane with Gerard Butler, after the two joined Jen’s friends in celebrating her birthday early last Monday. This entry was posted in Celebs, Gerard Butler, Jennifer Aniston on February 28, 2010 by admin. Britney Spears gets blonde extensions again. There have been rumors that the 28-year-old pop princess will release a new album this June but it’s not true! “There is no scheduled release date for a Britney album at all,” her label rep said. “There has been zero discussion about it.” Britney Spears is in the process of creating new music but don’t expect her to be releasing her next album in June! This entry was posted in Britney Spears, Celebs on February 28, 2010 by admin. Hollywood celebs Brad Pitt and Angelina Jolie brought 19-month-old twins Knox and Vivienne out of hiding on February 22 for a stroll through beautiful Venice, Italy. 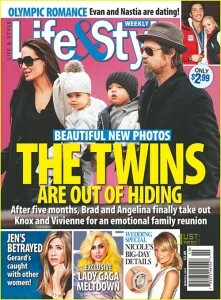 According to Life & Style magazine who has the deets on the family affair: “[Angie] was fussing over the twins to make sure they were covered,” a witness tells the mag. “She was being a very loving and doting mom. She even wanted to make sure their little ankles were covered — it was very cute!” The cold wasn’t getting them down. “The whole family seemed happy,” the witness adds.